Mauro Perucchetti adapts from the fable of The Three Little Pigs to aid in his artistic practice. The story instils morals about our demeanour and attitude towards responsibilities, admonishing us to be proactive in life down to the small details. Maura redefines this notion in his work by coating the pig’s entire body with Swarovski crystals over earth tones, a conceivable reflection of people today who pursue material appearance instead of sensible virtues. 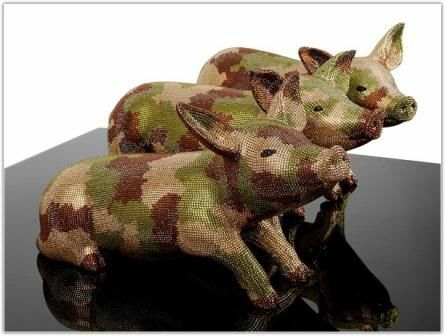 The earth tones correspond to camouflage patterns used by the military to conceal themselves, a suggestion of Perucchetti’s pigs trying to hide from imminent reality in disguise. He questions the mass culture today, the phenomenon of people obsessed with false cover. I'm interested in this Still Three Little Pigs by Mauro Perucchetti. Please advise availability and price. Thank you. 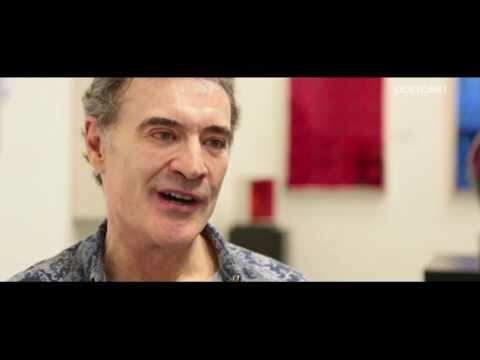 Mauro Perucchetti was born on 1 January 1949 in Milan, Italy. 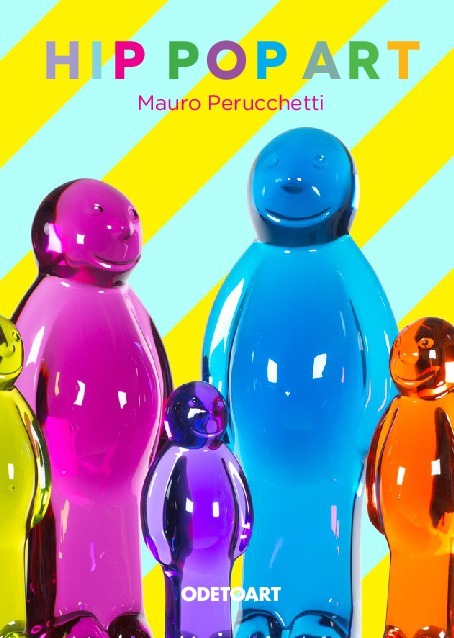 A pioneer in the field of resin, Mauro matches social critique with Pop aesthetics and art that demonstrates his astonishing technical skill, style and wit. 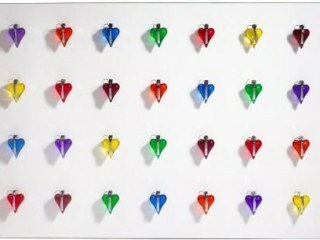 Currently based in London, the artist has achieved immense international acclaim in recent years with a range of solo and group shows around the world, including London, Paris, Oslo, Vienna and Miami. 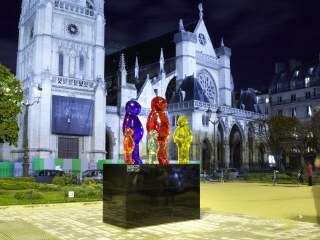 Some of Mauro’s significant public installations include his Jelly Babies installation at Marble Arch, London, and prominent placement in front of the Palace du Louvre during FIAC 2012. Mauro Peruchetti’s work is a mixture of Minimalism and Pop, fused together with an elegance and an ironic wit that seem typical of a certain kind of Italian sensibility. For example, one of his key symbols is the Jelly Baby – a little sweet in rudimentary human form, which for him symbolizes the disposability that permeates all aspects of the contemporary consumer society. He uses it to mock the aspirations that this society claims it has, but which so often cynically betrays. What we meet in this exhibition is a Jelly Baby converted into a giant image of Buddha, and rows of Jelly Babies in different colours who come together to create the model of a skyscraper – an imaginary headquarters for the United Nations in New York, slightly grander and more elegant than its present building. We also meet a roll of toilet paper entirely covered in Swarovski crystals – as pithy a metaphor as one can imagine for useless, senseless and perhaps injurious luxury. The Swarowski crystals are an unusual material for Perucchetti. 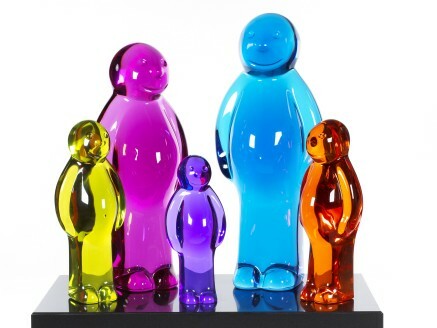 What he is really in love with is the glowing transparent resin that is his primary material. A small group of works here are abstract and make no specific moral or political point. In two, the plastic forms a kind of rippling pool, coloured a glowing orange. Looking into the depth of these pools, one can perhaps imagine the presence of submerged images – from "200 Orange & 4 Purple," a giant eye seems to gaze back at oneself, while in "Evaporating Thoughts" one can perhaps discern a submerged medusa, her head surrounded by floating strands of hair. My reaction to these panels reminds me of Leonardo’s famous instruction to a painter seeking original composition – to look at an old mottled wall, and find a figurative image in its random markings. Another piece, entitled "LSD (Limited Slip Differential)", genuinely rejects figurative imagery. It consists of projecting triangles of resin placed against a white ground. The edges of the triangles are coloured, the centres are clear. When light strikes this array of shapes, a magical play of different hues appears. This is ‘optical art’, but of a very different kind from the Op Art of the 1960s and 1970s. The punning title hints that the optical effect is due to a hallucinatory drug, but really what it springs from is a savvy use of contemporary technology. Yet there may be an underlying moral here, even if there is no specific image. LSD speaks of the way in which technology can be used to produce delusions about society itself. It is interesting to contrast this piece with another which looks superficially similar but is in fact very different in both intention and in effect – in this second case the white panel offers what look, at first glance, like elegant scent bottles in various hues. 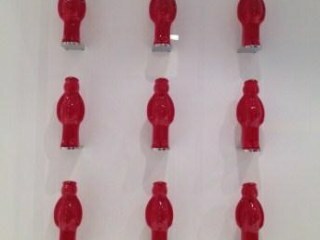 It is only when one looks more closely that one realizes these are not scent bottles but representations of hand grenades. There are other instances of this aestheticisation of the deadly included here – for example a replica of an AK47 rifle in transparent red resin, and another of an artificial leg, also in resin, but with a metal foot. These works are political statements but the idiom is resolutely Pop. It is interesting to compare some of them with their direct predecessors in the history of Pop Art, since Perucchetti is clearly not afraid of comparisons of this sort. "The American Flag" alludes to the celebrated series by Jasper Johns, the first of which was created in 1954. It’s crackled surface suggests the way in which a split America seems to have compromised its moral authority in the interim. "USSR" combines the hammer-and-sickle emblem of the now-defunct Soviet Union with dollar signs gradually creeping in from the margins. It refers to Andy Warhol’s dollar-sign series made at the beginning of the 1980s, when the Soviet cosmos and the American one still seemed to be rigorously opposed, and has something to say about the impact made by Enron-style capitalism on the Soviet Union’s successor state. The idea of a ‘moralised’ Pop may at first seem paradoxical, since Pop, in its original American form was amoral in the most literal sense, uninterested in social issues and also in codes of conduct. However, it is at this point that one has to recall that Perucchetti is Italian, though he lives and works in Britain. The Italian Arte Povera movement, founded in 1967, took over ideas from American Minimalism and Conceptual Art and used them as the basis for a powerful social critique that was not to be found in the transatlantic originals. Perucchetti operates the same way vis-à-vis his Pop source materials. The works in this show have a studied elegance which seems, to use the adjective in a loose sense, very Italian. But they also make pithy comments on a wide range of moral issues.